Award winning writer, Norman Jorgensen is proudly Western Australian and has set most of his dozen books published in WA. They range from graphic novels and bestselling picture books to well-researched historical novels. Norman began writing when in primary school and had a story read on the ABC Radio Argonaut’s Club, but it took many years for his first graphic novels to be to be published. His picture book The Call of the Osprey, also illustrated by Brian, set on the Swan River in 1910, is a poignant and beautiful story about dedication, loyalty, and friendship. A Fine Mess is a story that truly lives up to its title! It is a superbly chaotic look at life for Michael Hardy, an accident-prone boy who just wants to have fun, snag the girl of his dreams and stay out of trouble. Michael’s misadventures continue in Another Fine Mess 002. The novel Jack’s Island, set on Rottnest Island during World War II has been well received, not only by the many students in Years 5 to 9 who study it at school, but also by their parents and grandparents who seem to appreciate the way Norman has accurately captured a simpler, more gentle time. Norman teamed with talented debut illustrator, James Foley, to produce his latest picture books, The Last Viking, and The Last Viking Returns. These popular new books, about a boy who outwits local bullies by channeling his inner Viking, are a lovely blend of gentle wisdom, fun, courage and imagination as well as a glimpse into Norse history and mythology. 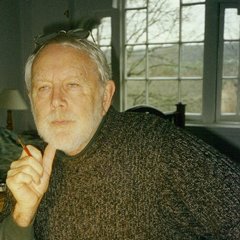 His latest novel The Smugglers’ Curse was published in October 2016. It is an exciting, action-packed adventure set in Broome, South-East Asia, Fremantle, Albany and in the final years of the nineteenth century. Written in classic piratical style, it should appeal to many young readers. It is selling very well and promises to be a huge hit. Norman is proud that his stories are almost always located in landscapes his readers can recognise. He feels it is important that readers can see aspects of their lives, history and experience reflected within the story and are able to identify with the landmarks, customs and settings of Australia. 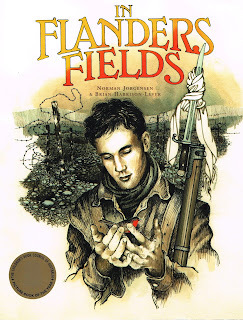 In Flander Fields was Norman Jorgensen's fourth book. Beautifully illustrated by Brian Harrison-Lever, this is the story of a homesick young soldier who risks his life to cross no man's land to rescue a robin caught in the barbed wire that separates opposing forces. In Flanders Fields won the CBCA Picture Book of the Year Award in 2003, the first of many awards. 'In paired-back text and sombre colours, this powerful and moving picture book for mature readers captures a moment of simple heroism and compassion which triggers unexpected camaderie in the midst of war. Name something positive you discovered while researching your book. I found nothing positive about researching The Great War and found myself becoming deeply angry about the stupid causes of the war and the paranoid governments that drove their countries to the conflict with indecent haste. I grew to hate the commanders, like Field Marshall Sir Douglas Haig, with his callous and total disregard for human life. It is not hard to detest someone who issued orders like, more officers should be executed for cowardice in a bid to strengthen the 'fighting spirit'. His gang of commanders included the incompetent General Ian Hamilton at Gallipoli, who watched the landing at Anzac from HMS Queen Elizabeth, before retiring to a quiet luncheon. These two and the other generals often fought the battles from their French chateaus sometimes a hundred kilometres behind battle front. All these years later, the anger still seethes in me at the waste of a whole generation of young men they sent to the slaughter. I still get choked up at the sadness and misery of the unimaginable losses suffered by families that were devastated for several more generations at the loss of fathers, sons, and brothers. Those men who survived and returned often had shocking injuries, shell-shock and had been gassed and never fully recovered. To add to their distress, at home they were poorly treated by the government, and many faced years of unemployment and poverty, all for King and Country. Name something sad/tragic you discovered while researching your book. The most tragic aspect of researching the war was looking at the faces of the soldiers. In every photo of the thousands I looked at, the men are always smiling, like naughty boys caught stealing apples. In some of their grins, you can see signs of hope, but in the vast majority, the eyes give them away. The smiles are put on, forced, knowing their families will see them. They didn’t want the people back home to know the horrific conditions they were being forced to endure. Tragically, that smile was often the last one their families saw. It would be that same faded photograph that sat on the mantle piece at home for years to come as a tragic reminder of someone loved and lost. Name something interesting that happened while writing your book. About halfway through researching and writing the book, I was discussing it with my 94-year-old grandmother, Nell, who suggested I go to the Western Front. She thought it might help me as I was having trouble finishing the story. When you go, she asked, could I visit the grave of her favourite Uncle Jim, James Bowen, who died in 1917 and was buried not far from Ypres. I agreed immediately and before leaving, searched the Commonwealth War Graves Commission for details of his gravesite. While doing this and delving deeper into my family history, I found six other relatives who had served on the Western Front that I had no idea about. Three of them died, and four returned. I managed to obtain from the Australian War Memorial archives all their service records and these captivating documents, and enlistment papers in their own handwriting, have now become an intriguing and valuable part of our family history.